Ken Gibson and John Singleton once answered a call to serve our country in the Marine Corps. Next, they went to law school and became attorneys in answer to a different call to serve others. Today, they are serving their community by speaking to local high school students in Gloucester, Mathews, and Middlesex about safe driving. Specifically, they’re sharing tools and strategies to help teens – and their loved ones — avoid accidents that injure and kill. As parents, and as a personal injury practice that sees the devastation caused by car accidents every day, our whole team at GibsonSingleton Virginia Injury Attorneys is passionate about preventing wrecks from ever happening. What are we doing to make our community safer? 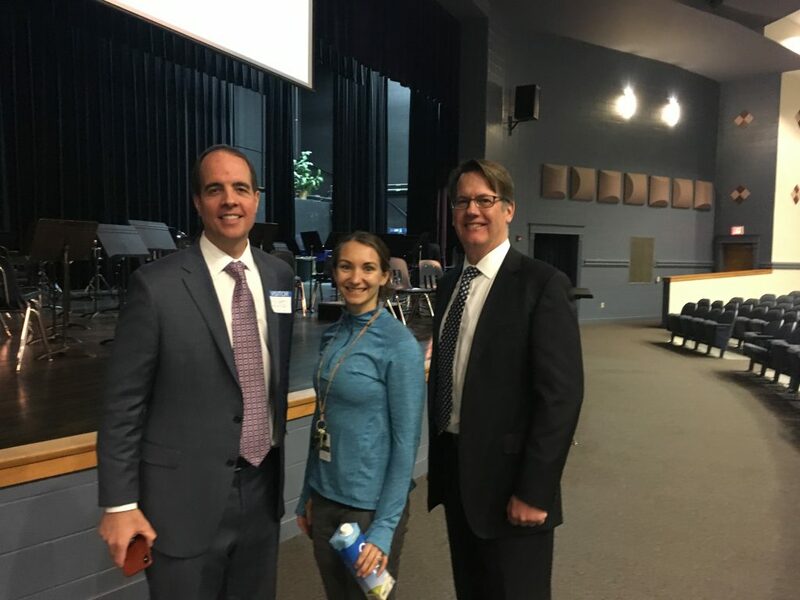 GibsonSingleton Virginia Injury Attorneys presented to 60 sophomores at Mathews High School on March 26 as part of their “Texts=Wrecks” campaign. Ken Gibson, MHS health and physical education teacher Kori Fielding, and John Singleton prepare to share “Keys to Safe Driving” cards with students. The card and other useful information are on gibsonsingleton.com. 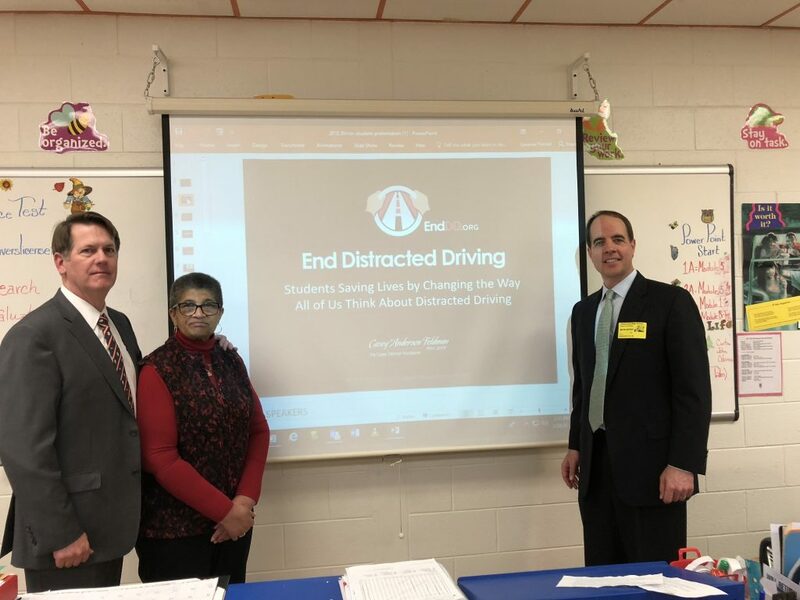 In March, Ken and John presented powerful facts about and real-life examples of distracted driving to more than 60 sophomores at Mathews High School and 200 sophomores at Gloucester High School. The attorneys shared information from a national campaign, End Distracted Driving, and the American Association for Justice. 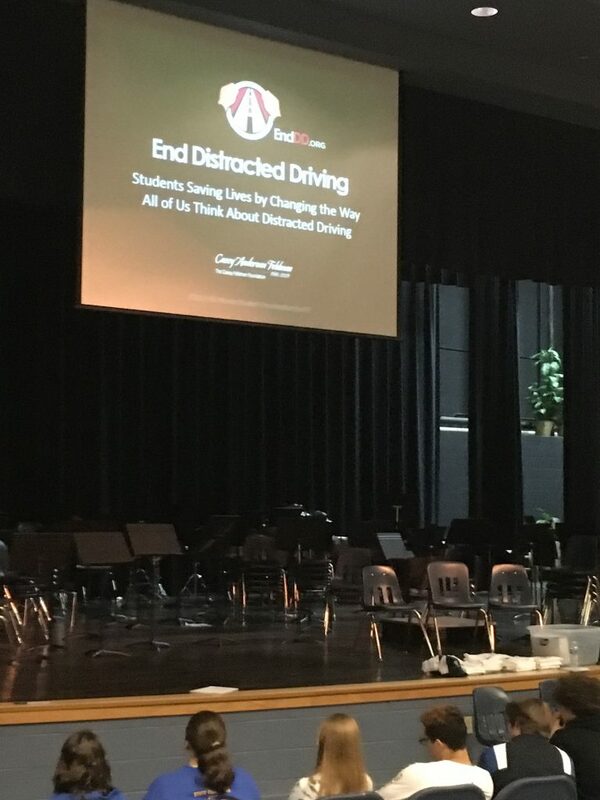 Speaking to Mathews High School sophomores, GibsonSingleton attorneys use a distracted driving presentation that’s part of a nationwide campaign by End Distracted Driving (EndDD.org) and the American Association for Justice. The program was developed by Joel Feldman, an attorney in Philadelphia, after his 21-year-old daughter was killed by a distracted driver. The attorneys are scheduled to stage a mock “driving under the influence” (DUI) sentencing trial for Middlesex High School seniors in April. The trial will demonstrate what can happen when teens drink alcohol and drive. What can young people and their parents do to help? The call to action in all of John and Ken’s presentations is asking students to sign and share a “Keys to Safe Driving” pledge with their parents. The pledge, adapted from one by the Centers for Disease Control and Prevention, gives straightforward steps to avoid the two biggest hazards for teens behind the wheel: impaired driving and distracted driving. The statistics about these dangers are alarming: Eleven teenagers are killed as a result of texting while driving each day in America. And 80 percent of Virginia all vehicle accidents are related to distracted driving. Meanwhile, people driving under the influence of alcohol or drugs still cost 10,000 American lives each year. Our pledge also includes promises that are wise for all drivers, such as always wear a seatbelt, stay within the speed limit, and never pick up hitchhikers. We were all teenagers once, and we can likely all remember making some bad choices. Developing better judgment is typically part of becoming an adult. Our “Keys to Safe Driving” pledge is meant to be a helpful reminder to all drivers that we have a great responsibility. We’re responsible — to ourselves, our families and loved ones, and to everyone else on the road — to make driving our primary task whenever we’re behind the wheel. 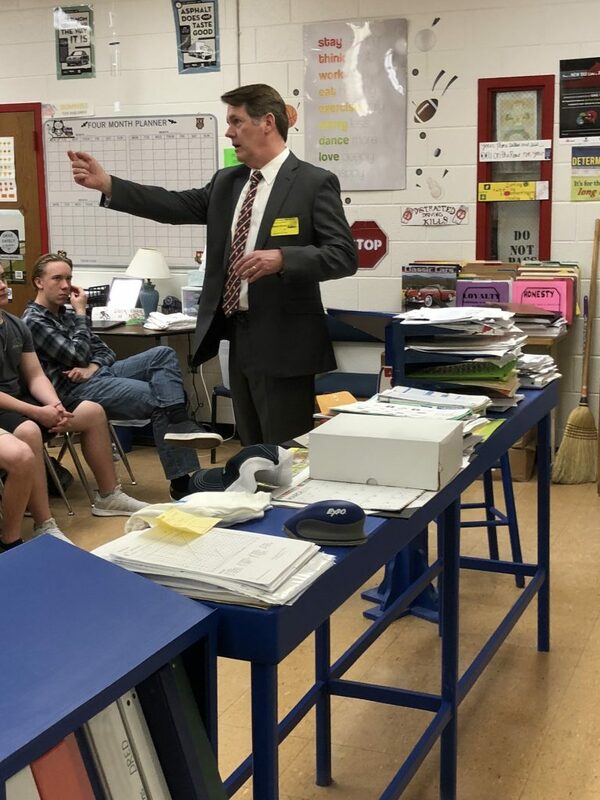 GibsonSingleton attorneys presented to approximately 200 sophomores at Gloucester High School on March 28, as part of their “Texts=Wrecks” campaign. Here, John Singleton explains the dangers of driving distracted to students, noting that when a driver glances at a text for just 4 seconds, while traveling 55 miles per hour, he has just driven the length of a football field without looking. What can we all do to make Virginia safer? Today, we have access to technology we couldn’t have imagined even 20 years ago; Smartphones, tablets, and apps have created countless new opportunities for distracted driving. Our team at GibsonSingleton Virginia Injury Attorneys knows that putting that device away when we’re behind the wheel is a challenge — for all of us! We launched our “Texts=Wrecks” campaign to raise awareness of the dangers of distracted driving, and to provide practical solutions. We encourage all drivers, young and old, to talk openly with your family and friends about safe driving, and the devastating consequences of a poor decision made while operating a 4,000-pound vehicle. We want to prevent accidents from ever happening. But we know that, while you can take proactive steps while driving to arrive at your destination safely, you can’t control the behavior of other drivers. What if you or your loved one get hurt by a careless driver? If you or a family member is injured by a distracted driver, you should not be stuck paying the often enormous bills. Our firm has experience working with big insurance companies, which are often reluctant to pay a satisfactory amount for your losses. We work with the local adjusters (we know many of them well), and we build your case by researching and presenting evidence to support the compensation you should receive. For a free case evaluation, call us at (804) 413-6777. Our service costs you nothing. We only get paid if we win you the payment you deserve to heal and move on with your life after a senseless crash.